With the year moving beyond the first half, Dubai Land Department (DLD) data shows healthy transactional activity in Dubai. Investment in Dubai’s real estate sector in the first half of the year crossed Dh57 billion, and there has been encouraging news coming out of Sharjah’s realty market too, with the city pulling in investment worth Dh12.1bn in the first six months of the year. The real estate market in Abu Dhabi, as always, continues to lure investors with high rental returns on investment and a great promise of capital value appreciation. In July 2016, Dubai’s real estate market remained strong with rental yields going as high as 6.5 per cent in select apartment categories. Overall, however, apartment rents became more affordable with a total downward adjustment in July of 2 per cent year-on-year. Average yield across all bed categories was recorded at 5.6 per cent. As per Bayut’s findings, the average rent for studio apartments in Dubai remained stable at Dh57,000 compared to the average studio rents in the first half of 2016. However, the average was down 6 per cent in a year-on-year comparison with July 2015. The units returned an average rental yield of 6.3 per cent in July 2016, with the average rent for 1-bed units recorded at Dh92,000 and rental yield hovering close to the 6.5-per cent mark. The average rent was 7 per cent less in July 2016 than the average rent in the first half of 2016. Two-bed apartments fetched owners Dh145,000 in July after a downward adjustment of 3 per cent. However, rental yield remained attractive at 6 per cent. Commanding Dh206,000, average rent of 3-bed units remained stable when compared with H1 2016 values, and the rental yield was 5.4 per cent in July 2016. The largest apartments, the 4+ bed category, returned an average annual rent of Dh304,000 in July 2016, exhibiting a 2 per cent drop in value from H1 2016. Average yield for these units was recorded at 4 per cent. For the month of July, the average apartment rent in the UAE capital was recorded at AED 126,000 per annum, a 6% downward adjustment from the average rent recorded in H1 2016. Still, the average rental return remained at an attractive 7% in July 2016, creating ample interest from genuine investors. Compared to values calculated in July 2015, the average studio rent in Abu Dhabi dropped 5% to AED 56,000 in July 2016, while rental values of 1-bed apartments adjusted downwards by 6% to AED 91,000. 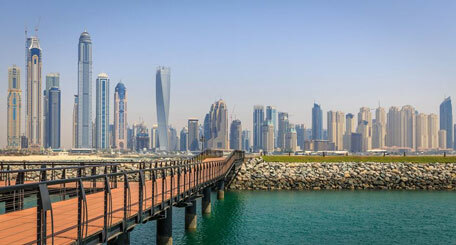 Two-bed and 3-bed apartment rents fell to AED 129,000 and AED 172,000, respectively, registering decreases of 4% and 5%. The average rent of 4+ bed apartments also came down by 4% to AED 247,000 on average in July 2016. However, the drops in rental values were neutralised by the impressive yields (7% on average) that the units in the capital offered. Studio apartments topped the yields chart by returning 7.4% in July 2016, while 1-bed and 2-bed apartments returned yields of 7.3% and 6.9%, respectively. The average rental yield of 3-bed apartments rose to 6.3%, while the 4+ bed category returned an encouraging 5.5% in rental yield during July 2016. According to Bayut, at a time of general global slowdown, the performance of UAE’s realty market continues to inspire trust in investors. Both Dubai and Abu Dhabi continue to be safe havens for global realty investors and the increasing prospects of Sharjah’s real estate sector provide yet another avenue for parking international wealth in a quickly developing market. Although rents have seen periodic adjustments, Bayut says it believes the UAE’s unique selling propositions such as a highly smart, diversified economy, security of investment and the great promise of Expo 2020 will keep the real estate and its allied sectors thriving in the months to come.